Book adapted from Voltaire by Hugh Wheeler, in a new version by John Ciard. Described as an operetta, Candide in fact resembles an American Broadway show more than it does Franz Lehar’s The Merry Widow; however, the sophistication of the text presents some problems of language comprehension not common on Broadway but that opera companies have learned to solve with Supertitles. And at least one of the many roles in the show, that of the beleaguered heroine Cunegonde, requires an actress with coloratura soprano chops, while the beautiful music of the eponymous hero sounds best when sung by an accomplished lyric tenor. LA Opera has both for this thoroughly delightful show: winsome tenor Jack Swanson, who is perfect for the part, charming and guileless in appearance; and spunky soprano Erin Morely, who endures the trials and tribulations of her character with effortless panache. 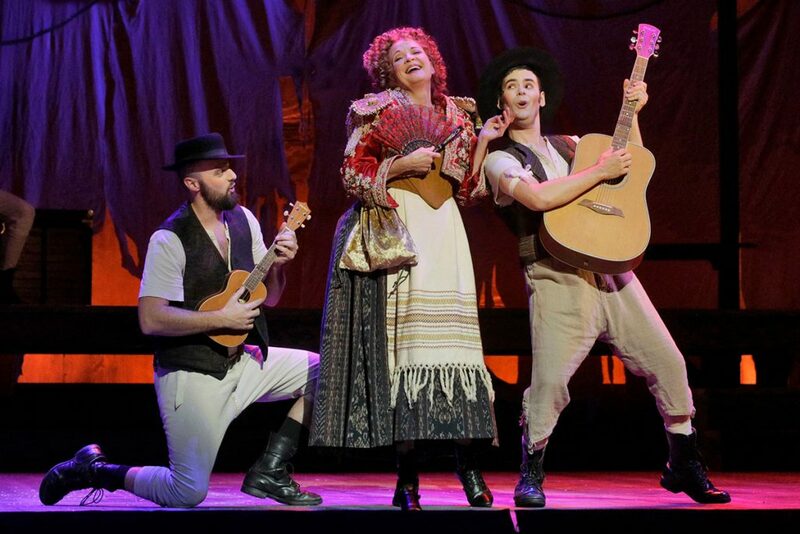 But the LAO has also enlisted TV and Broadway star power for roles not intended primarily for opera singers. They are, of course, the tremendously popular Kelsey Grammer (Cheers, Wings, Frasier) in the twin roles of the actual thinker/novelist Voltaire and the fictional deluded optimistic philosopher, Dr. Pangloss; and, virtually stealing the show with her canny moves, Broadway veteran Christine Ebsersole (Grey Gardens, War Paint, 42nd Street) as the Old Lady. I would merrily return to the theater again and again just to see her inspired number, “I Am Easily Assimilated,” in which she conveniently and suddenly becomes Spanish due to dire circumstances — and before long she has generated an insanely exuberant production number. I was reminded of the “Too Darned Hot” number which so often becomes zannily energetic in Cole Porter’s Kiss Me Kate. 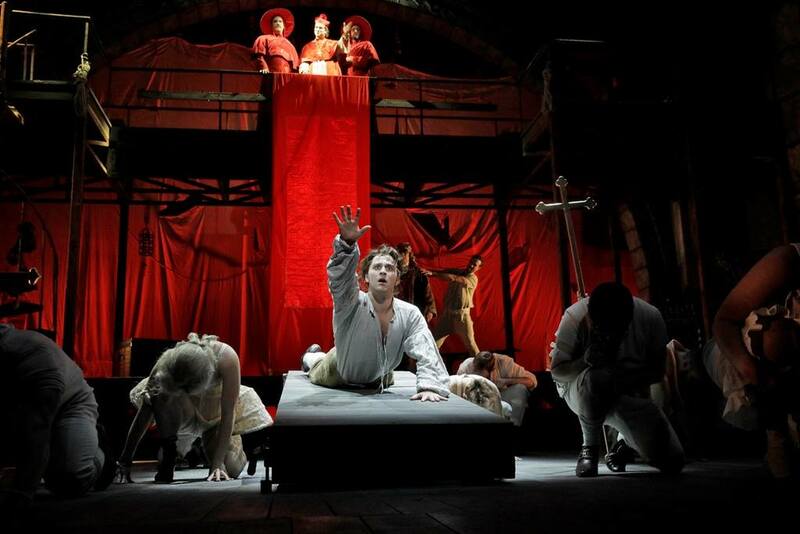 Under the stage direction of Francesca Zambello, this Candide is a marvel of clear storytelling, something that is, quite frankly, a major problem in a satirical mini-mock-epic that shifts ground from one city, country and continent to another at dizzying speed. How do you represent this on stage? We go from Westphalia to place after place including Lisbon, Paris, Venice, Montevideo and even to the legendary land of Eldorado. We go through shipwrecks, an earthquake and the Spanish Inquisition. Poor Candide (Jack Swanson) meets the Spanish Inquisition. LA Opera. Photo by Ken Howard. 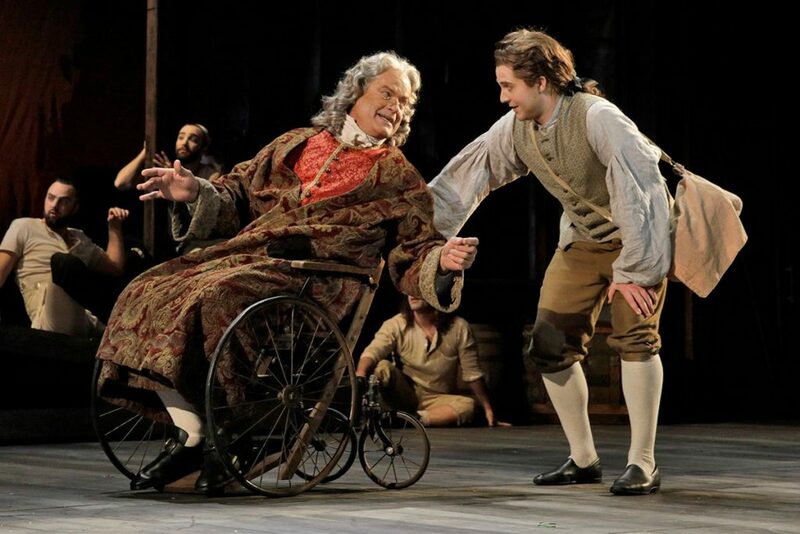 In short, it’s a picaresque tale with a picaresque couple, Candide and his beloved Cunegonde, who are forced for the most part to go their separate ways, all the time absurdly confident in the Leibnitz philosophy of “optimism” as inculcated by their beloved professor, Dr. Pangloss. “It’s the best of all possible worlds,” he repeatedly argues with all sorts of elaborate proofs — and then our hero and heroine barely escape one appalling horror after another. Sometimes the show’s characters don’t escape at all but die and impossibly return to life for more suffering. Zambello, utilizing the flexible scenery designed by James Noone, creates areas that are continually shifting in appearance and purpose to indicate different locales or modes of transportation such as pirate ships or life rafts. The men and women of a large ensemble can play whatever role is required with Jennifer Moeller’s cleverly ambiguous transexual costumes. Significant actions are mimed with the narrator (Voltaire) explaining them. Thanks to Zambello, there is little reason for the audience to be confused. The continually changing settings may have discouraged both producers and audience in the past. 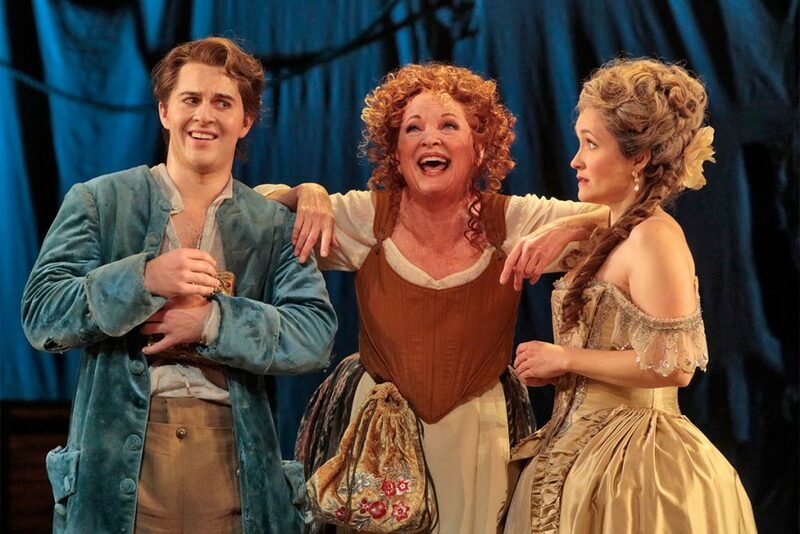 This Candide boasts many outstanding performances. Cunegonde’s naughty friend, Paquette, is played with saucy élan by the wonderful mezzo-soprano Peabody Southwell. Bass-baritone Matthew Scollin gleefully inhabits the part of Martin, a pessimist whose negativity is so extreme that his one great musical number consists of guttural eruptions of disgust. Earlier in the show Scollin had amusingly played James, an Anabaptist who falls off a raft and downs. Baritone Theo Hoffman creates much fun as the vain and arrogant Maximillian who relentlessly opposes the marriage of Cunegonde to Candide. They wed only at the very end of the show. The piece is further enriched by the presence of tenor Joshua Wheeker as Cacambo, tenor Brian Michael Moore as both the Grand Inquisitor and a Governor, and contralto Taylor Raven as Vanderdendur. As Voltaire, Kelsey Grammer acts as a virtual master of ceremonies, but he must also play Dr. Pangloss, an MC of a different sort who comically proselytizes for his eternally sunny view of God’s universe. He has many memorably comic songs to sing (“The Best of All Possible Worlds,” “Dear Boy,” ”What’s the Use”) none of which offer operatic challenges, but a good deal of the music lies a tad below Grammer’s level of comfort as was evident despite his exuberant performance. A priceless song about the transmission of syphilis also exists for Pangloss, but this was entirely omitted for some reason. Although Erin Morely is a good choice for Cunegonde and she has exactly what it takes to meet the show-stopping coloratura requirements of “Glitter and Be Gay,” our heroine’s lament about being miserable and incredibly wealthy at the same time, Morely was so wildly restless while executing so much comic schtick that her flawllessly sung aria was undermined by wretched excess. It’s interesting to note that Bernstein’s attack on optimism is in the long run, well — optimistic. Everyone surrenders to the notion that the universe is neither good nor bad and what we must do about it is simply get on however we can, tend our flocks and make our garden grow. This is developed into a gorgeous and extemely moving musical hymn at the end. It resembles in many ways “There’s a Place for Us” at the end of West Side Story . It’s difficult to ignore the sad but essential hopefulness in the music and lyrics of both Bernstein finales. The chorus, under the guidance of Grant Gershon, is super. And the Los Angeles Opera is extremely fortunate to have condutor James Conlon who brings energy and revelatory details to all his work with the company. This Candide is no exception. 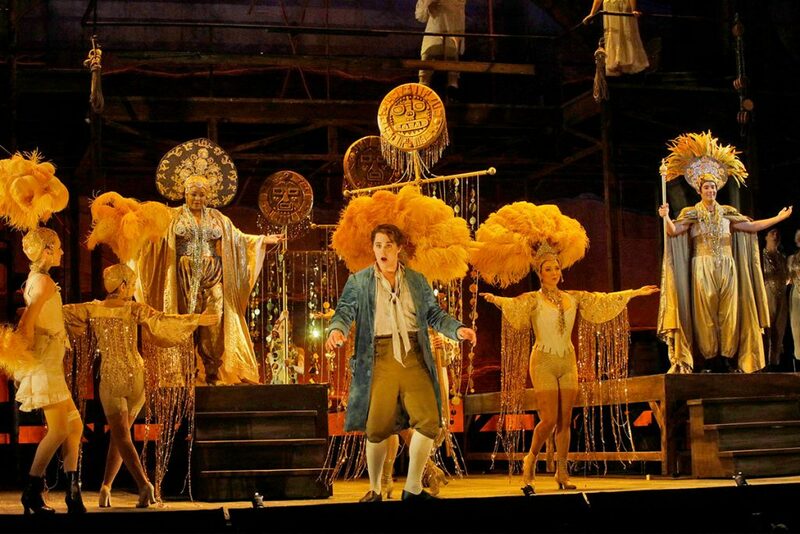 Candide (Jack Swanson) finds himself in a high-camp Eldorado. 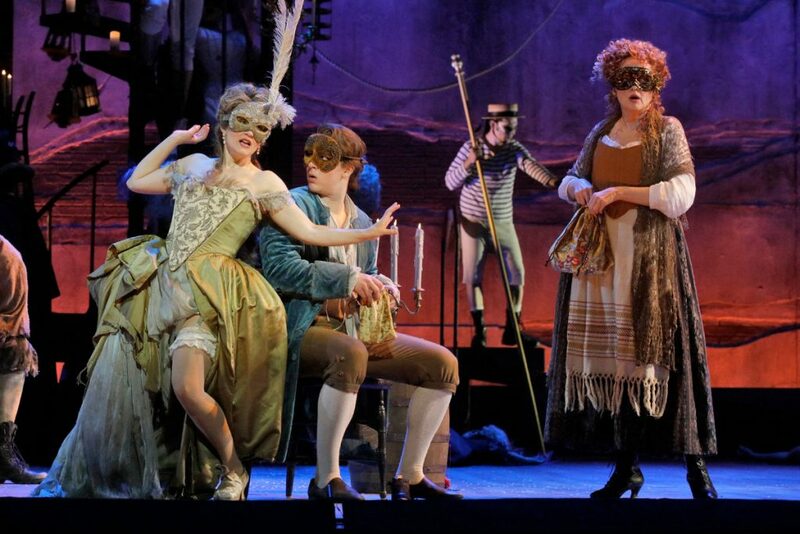 The LA Opera’s Candide ensemble. Photo by Ken Howard.